The panel, moderated by Clare Kramer (Buffy the Vampire Slayer) spent most of its hour taking fan questions, and we learned some pretty interesting things about the stars before they jetted off to finish shooting Season 3 in South Africa. At the end of Season 2, Claire had thrown herself back into the twentieth century as Jamie grimly faced the Battle of Culloden. When Season 3 resumes, the two will have lived decades without each other. As we know from Season 2 flash-forwards, Claire returns to Frank (Tobias Menzies) in this time to raise her and Jamie's daughter. "Claire believes Jamie has died, so there aren’t really any options," Balfe says. "I think she does what any mother would do. She tries to survive." She later added: "You see how these two people had to live without each other, and I think that’s a really important part of who they’ve become." As for Jamie, Heughan said, "If people have read the book, they know that it picks up where [Season 2] left off, so we do get to see Jamie’s journey without Claire. Basically, Jamie’s not himself. He’s being anyone but Jamie Fraser, so it’s about his journey back to Jamie Fraser." Claire is without her soulmate...for now. 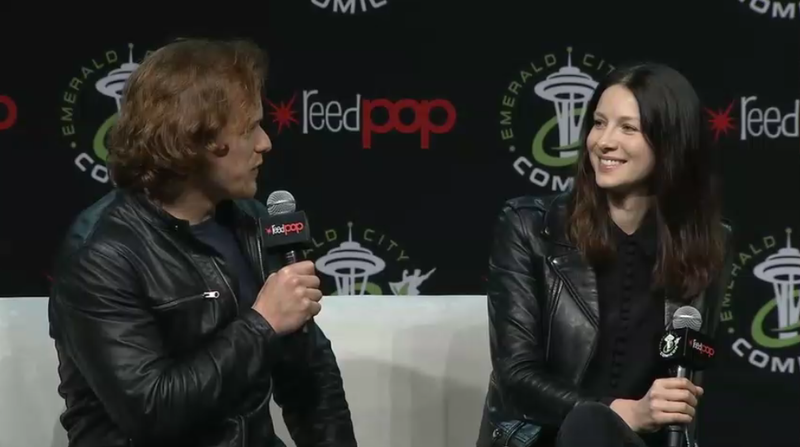 Most fans in the Main Stage at ECCC were definitely geeking out over the two Starz leads, so it was interesting to see who Balfe and Heughan had obsessed over meeting themselves. For Balfe, it was film star Faye Dunaway, who was wrapped up in the Oscars' enormous gaffe earlier this week. "I was just like, 'Oh my God, can I take my picture with you?' and she let me!" Balfe exclaimed. Heughan told the crowd that he's planning to wear his Stranger Things t-shirt to the con the next day, and would love to meet Millie Bobby Brown. He also cited an embarrassing run-in with Jeremy Renner recently. "We were at the bar at this Oscars party, and he came in between us to get his drink," Heughan says. Then Heughan reviewed his internal dialogue, which went something like: Do I say something? Do I not say something? Oh my God, Oh my God, Oh my God, before eventually blurting out, "You’re really good in Arrival!” Apparently Renner replied with a simple, "Thank you, brother" and scrambled away from Heughan. "I hope I don’t bump into him now, or he doesn’t recognize me," he joked of the star, who is also at ECCC this weekend. Which 'Outlander' cast member do you think has the best eye for photography? Stars are people too, so why should ghosts be choosy about who they haunt? One fan question drew in surprising results as both Balfe and Heughan had supernatural mysteries to recount. Balfe's occurred while she was living in Japan, and we swear it sounds like an early 2000s horror film. "I had a ghost in my room," she says. "I was like 19, and I could feel there was something in my room," she said, while explaining that the lights and television would turn on and off without reason. "One day, I felt something like this [lightly brushes the top of Kramer's head repeatedly] and it scared the bejesus out of me, so I moved out the next day." Probably the best idea! Heughan's was even more mysterious. "I used to play the trombone, and someone bought me a wind-up metronome," he explains. "One night, after they had passed away, I was thinking about that person and the door was closed and the windows were closed and it started ticking, when it hadn’t moved in years." Our biggest takeaway from here is definitely the baffling image of Heughan playing the trombone, not that both of the Outlander leads attract apparitions. Although Season 1 very closely resembles Diana Gabaldon's first book, there are of course a few exceptions. While it's understandable that they couldn't film the moment where Claire finds herself face-to-face with the Loch Ness Monster, Balfe was still hoping to take on a wolf in front of Wentworth Prison. In the book, Claire ferociously snaps the wolf's neck. Unfortunately, that wasn't going to fly on EP Ronald D. Moore's set. "First of all, we nearly killed an actor with some dogs," Balfe says. "We tried to do the scene where Father Bain [Tim McInnerny] gets attacked by the dogs, but he actually got attacked by dogs, so we kind of nixed the wolf scene." Yikes! Spoilers for fans who haven't read the books: Gabaldon's third book Voyager (off of which Season 3 is based) features a reunion scene between Jamie and Claire in a print shop. This decades-in-the-waiting reunion between the two is probably the most anticipated moment in the upcoming season for fans. Heughan even sent a stream of tweets teasing the scene while filming late last year. While Balfe and Heughan wouldn't actually say a word about this, one fan cleverly asked if they could give their best facial expressions in regards to the question, "How closely does the print shop scene resemble the book version?" Both Balfe and Heughan did a squinty-eyed half-shrug, with a strong head bob. You'll just have to figure out what that means on your own.